What's that you say? A new play opens on Broadway to great reviews and it's not an import from London? What will they think of next? 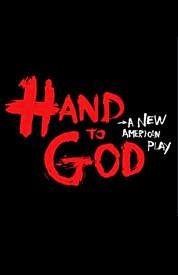 Hand to God which opened at the Booth Theatre on April 7 is written by Broadway newcomer Robert Askins and is being produced by Tony winner Kevin McCollum (Rent, In The Heights, Avenue Q). By the way Avenue Q is one of my favorite Broadway shows of all time. I mean who doesn't love a show about inappropriate puppets singing songs? Now while there is no singing in this show and the puppet in this one may be a little more twisted than the ones in Avenue Q it is still just as interesting. At least that's what the critics say. I unfortunately have not seen it yet. Here's hoping I get the chance too very soon. O.K. so now that I have peaked your interest I'm guessing you might want a little more info about the show before you purchase tickets for it right? So here you go. Enjoy! The hilarious and provocative Hand to God centers on shy, inquisitive student Jason, who finds an outlet for his burgeoning creativity at the Christian Puppet Ministry in the devoutly religious, relatively quiet small town of Cypress, Texas. Jason's complicated relationships with the town pastor, the school bully, the girl next door and—most especially—his mother are thrown into further upheaval when Jason's hand puppet Tyrone—once soft-spoken—takes on a shocking and dangerously irreverent personality all its own. As Tyrone's influence over Jason steadily grows, Hand to God explores the startlingly fragile nature of faith, morality, and the ties that bind us. See? I told you it was twisted now didn't I? I don't know about you but I want to see it even more. Now just in case you need a little more convincing I have taken the liberty of attaching a few of the awesome reviews of the show for you to peruse in case you are still on the fence. Hopefully they will convince you to take a chance on this little show and buy a ticket to see it. By the way for those of you who are ready to order now you are in luck. We sell tickets for it. In fact from now thru June 7 you can purchase tickets to see Hand To Got at some great savings. Be advised that while this "Special Offer" is good thru June 7 it is for select seats and as always subject to availability. Get your tickets to see Hand To God on Broadway at the Booth Theatre. Until next time theatre fans.